Space and style are the standard as Victorian opulence merges with modern convenience in this early twentieth century building. Built at a time when apartments were meant to be homes rather than mere living spaces, the one and two-bedroom apartments at 5757 feature immense rooms where pristine Mission Oak prevails from the floors to the built-in bookcases. 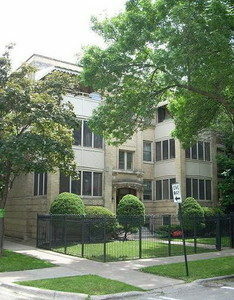 Each apartment features a formal dining room, a private balcony for enjoying Chicago’s warm summer evenings, and large, abundant windows for ample sunlight and cross-ventilation. Rent includes heat and water. Garage ($165/mo.) or outside ($140/mo) spaces are available for parking within steps of the building.